Home » sake and food » sake in my pocket #2. staff meal. boston ma. sake in my pocket #2. staff meal. boston ma. 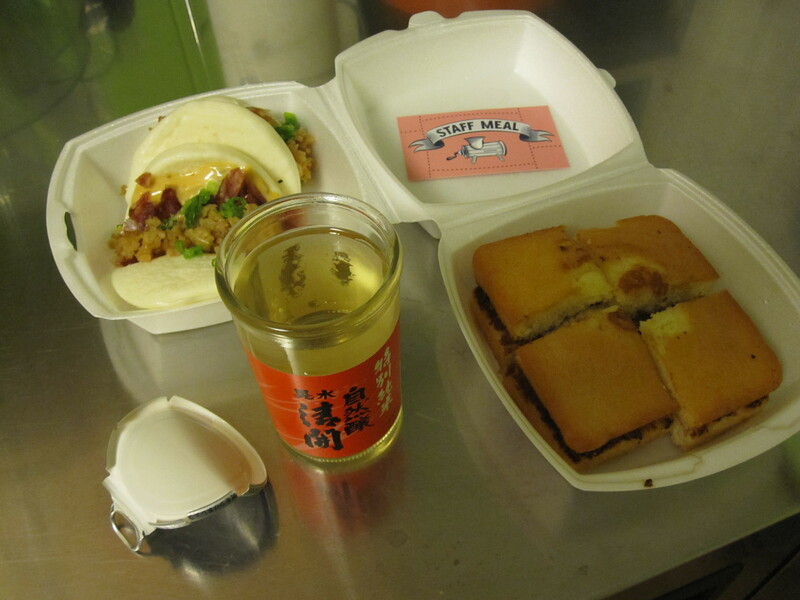 The last installment of Sake in my pocket saw the pairing of canned Sake with a great local food truck food. 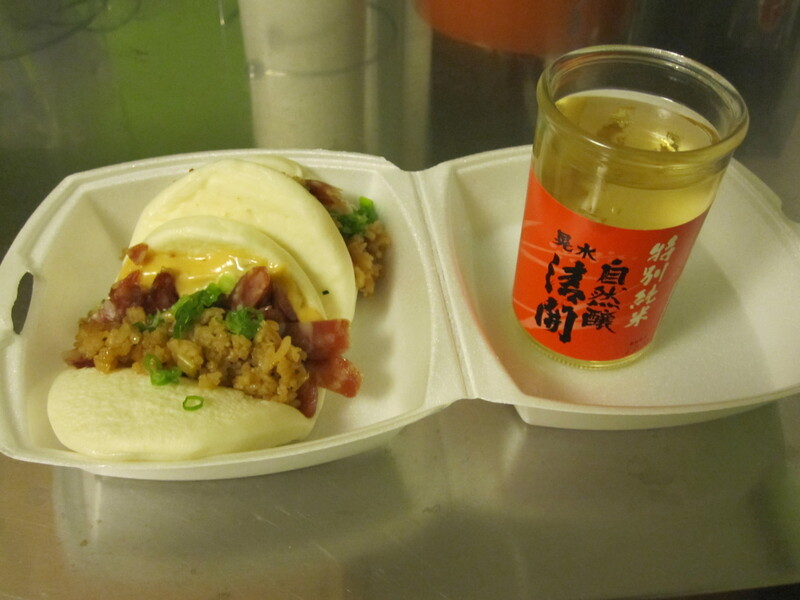 This week’s post tackles another great food truck but instead of cans, I am using cup Sake. For those out there who have never encountered cup Sake, it is a method of packaging a 5-6oz. glass of Sake with a vinyl lined metal lid. This unique packaging was pioneered by the Ozeki brewery for there budget priced Sake and has been a huge hit ever since. For more information on cup Sake, read a guest post that I did on urbansake.com. Although started as a package for cheap Sake, cup Sake is now used by smaller breweries as a convenient package for their higher quality Sake. 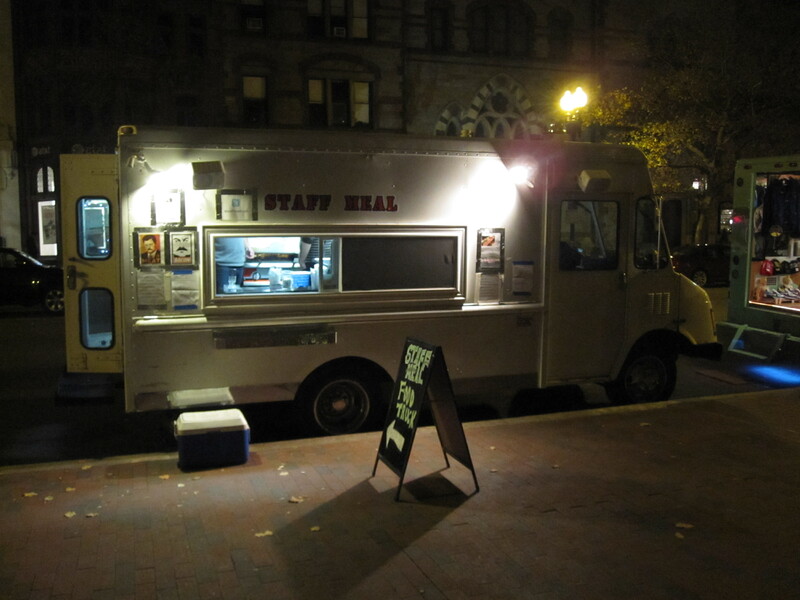 The Truck: Staff Meal – multiple locations but mostly South End and Back Back. Open for lunch and dinner. The Sake: Kosui Shizenjo Seikai cup Sake. Junmai, 60% rice milling rate, 15% alcohol. Staff Meal was inspired by the ad hoc meals that chefs often cook for their staff before or after a shift. After working in restaurants for years, the guys at Staff Meal decided to bring this inventiveness to the public with their food truck. Churning out a small but interesting menu of meat-focused foods, it is no wonder that the back of their business card says “We Cure Vegetarianism”. The first thing I ordered was their Chinese steamed buns; made with truck-made sausage, fried rice and fermented black bean mayonnaise. A steal at $4 for 2 buns, these did not disappoint. The truck-made sausage was not your typical breakfast link but a real, toothsome cured Chinese sausage that delivered on both meaty flavor and a pleasant fattiness that you get from those types of sausages. The simple fried rice added a nice spot of texture and brought some great sesame oil flavor. The biggest surprise was the mayo, which was very creamy (almost remoulade-like) and brought an interesting earthy, spicy quality that lingered even after it was washed away with Sake. Even though the Sake was clean and balanced with sweet rice upfront and pronounced apple and melon notes as it warmed, this pairing served to highlight texture more than flavor. The flavors in both the food and Sake were great but what really interested my palate was the counterpoint of clean, slightly dry Sake cutting through the Chinese bun’s amazing creamy goodness. With a triple hit of meat fat in the sausage, sesame oil in the rice and heavy, creamy fermented black bean mayo – this was sinful and savory mouth candy, wrapped in a steamed bun. Meat loving chefs are not usually known for their dessert prowess (just watch Top Chef! 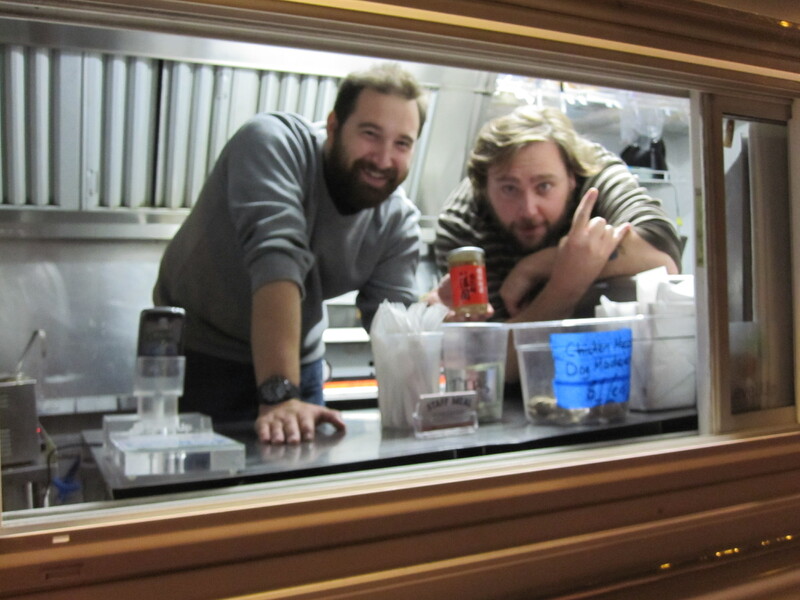 ), for that reason you don’t see many desserts at food trucks. The “sweet” section of the menu at Staff Meal held a nice surprise – pound cake griddled in beef fat and sandwiched with apple butter. Each warm, crusty fried cake bite hid an explosion of Sake friendly flavors; vanilla, apple, peaches, and slight spice all playing together with a soft, tender cake mouthfeel. Paired with the Sake these flavors were a perfect match to similar fruity fermentation flavors in the brew, both of which danced back and forth as your tongue struggled to find the balance between cake and liquid. 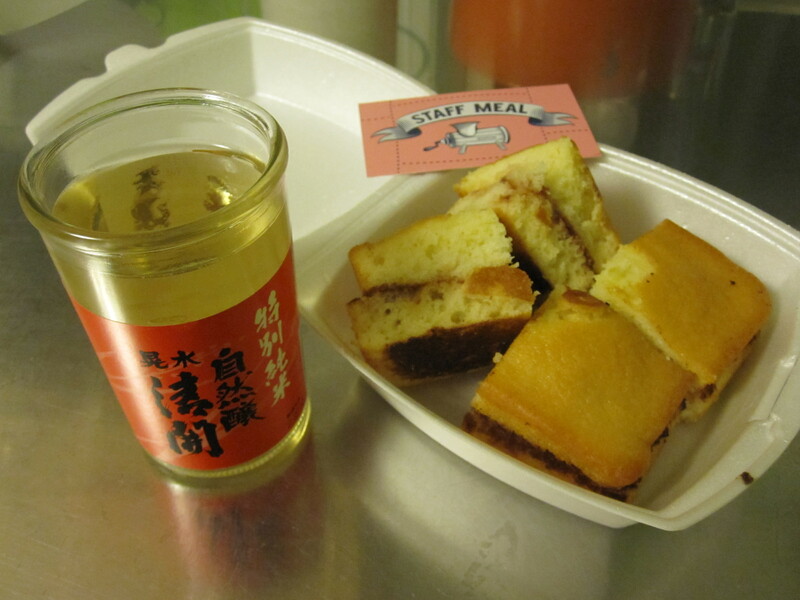 The aftertaste was one of rich rice and a background hint of savory from the beef fat that the cake was griddled in. The cake did an excellent job of pulling out some of the more complex rice notes in the Sake that were hidden with drinking straight from the cup. This dish was one of those simple desserts that after tasting, you wonder why you have never tried it before. This was a great pairing experience, especially considering it was a bit cold and windy on Boylston Street that night. Sake’s versatility really shines here along with the continuing trend of delicious food to be found on the streets of Boston. I hope that these posts are helping my readers to see that Sake is not simply alcohol to wash down Japanese food, but a nuanced beverage whose impact on the Boston food scene is in its infancy. Stay tuned for more trucks, and if you see a guy walking down the street with a can or cup of Sake in his pocket – you know that he is heading toward something delicious.